When Greg and Barbara first met in college, little did they know they would embark upon a journey that would shape who they are today and have such an incredible opportunity to make a difference in so many lives. Though they came from very different family backgrounds, the Deris’ experiences have molded them into a dedicated, passionate team whose commitment to improving the lives of seniors became their mission. Locals, Greg and Barbara Deris are co-founders and co-owners of St. Francis Villa with Ray and Marcus Naquin. 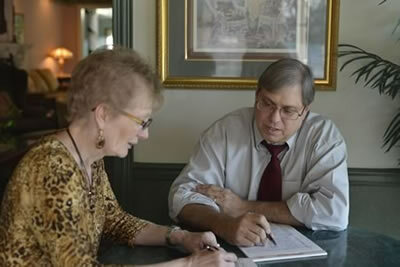 Greg and Barbara work at St. Francis as Chief Executive Officer and Director of Resident Services. Since opening day, Greg and Barbara have been on call 24/7 for fourteen years. The evidence of God’s blessing upon their journey shows at St. Francis Villa; in part, as measured by kind words, letters of appreciation and full occupancy for almost fourteen years, in spite of increased competition from all avenues for care. The Deris’ bring to St. Francis their backgrounds in geriatric health care. Greg is a licensed Nursing Facility Administrator for 24 years and Barbara a Registered Nurse for 38 years with 24 years as a Director of Nursing and a Nurse Consultant. Their years of experience caring for the elderly, paired with their personal desire to create a unique living opportunity for seniors led them to seek out a new paradigm in which to live out their calling. St. Francis Villa specializes in assisted living and is not a medical model as is a nursing home. This is an important distinction. The new paradigm for hiring and training staff with work experience outside a medical model has been successful for St. Francis. Our social model encourages independence and fosters a sense of family that offers choice and helps keep dignity intact rather than “enabling” by a staff trained for a medical model.